I don’t keep sharp knives in the house. Seriously. I’m not a chef, and actually, I barely qualify as a cook, even when I’m the one putting dinner on the table (which is most often a TV tray, let’s be real here!). So…no knives. Until I found Keramikos Kitchen. 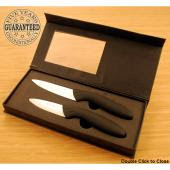 They sent me a couple of their ceramic knives to test. I’d never heard of, let alone seen, a ceramic knife prior to this. 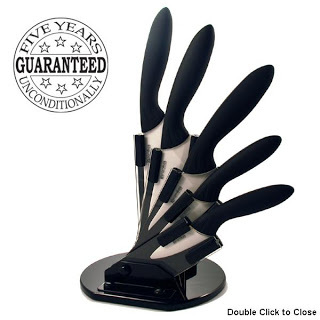 I read about them at their blog and found that they’re not meant for chopping; actually, if you use them like a cleaver, you risk breaking them. I was intrigued. A knife for slicing. I do slice things. I eat a decent amount of fruit, especially in the summer, so having a good slicing knife would be pretty nice. They are nice. I cut up some fresh strawberries last night and the paring knife made it a piece of cake. Actually, the biggest advantage I saw was how thin I could slice them. Not only could I slice them really thin, but it was a uniform slice (instead of the kind of slice that starts out thin and gets progressively wider as you make the cut). I read on the Keramikos blog that ceramic is “chemically inert,” so I did a little experiment. I tried the 6″ chef’s knife they sent on a head of iceberg lettuce. Usually, lettuce browns shortly after it’s cut with a metal knife. Sure enough, no browning with the ceramic blade. All this time, I assumed I was getting crappy lettuce! The other thing that won’t happen with ceramic knives is the transfer of flavors from one food to another. You can go from slicing garlic to fruit and since the blades don’t absorb the juices of what they’re cutting, the flavors won’t mix. That’s one less thing to wash when you’re done! Speaking of washing, these should be hand-washed to give them the longest lifespan possible. They’re guaranteed for five years (sweet! ), too. Personally, I hate having to hand-wash anything, so these have been through my dishwasher. They did fine. One thing that struck me when I opened the package was that one blade was white and the other, black. I checked out the Keramikos Kitchen site and found out that the black one is made of zirconium carbide, which turns black when it’s fired in a kiln. The harder material makes them less likely to be damaged from misuse. I was pretty glad they sent that, because (like when I put them in the dishwasher), it’s pretty likely that they’ll see some misuse here (even though I’ve banned hubby from using them). Ceramic blades will break if they’re dropped or misused (ahem, husband!). On the other hand, they’re a lot lighter than their metal counterparts. If you approach this from a “right tool for the right job” standpoint, I think most kitchens could benefit from having a couple, especially the paring knife for fruit. Since the ceramic blades are about 50% harder than stainless steel, the blades keep their edge much, much longer than a metal knife. You can enter up to SIX times for these babies! Leave a separate comment for each, please. Giveaway runs until June 10, 2009, 11:59pm EST. This entry was posted in GIVEAWAY, HOUSEHOLD, KITCHEN on May 28, 2009 by makesmomhappy.